Mim’s life is with Grainger’s Side Show along with a “dwaff”, a learned pig and Alex, a boy who has only one arm. Welcome to the world of Georgian entertainment. But this is also the Age of the Enlightenment when scientific discoveries and experiments are exciting society. 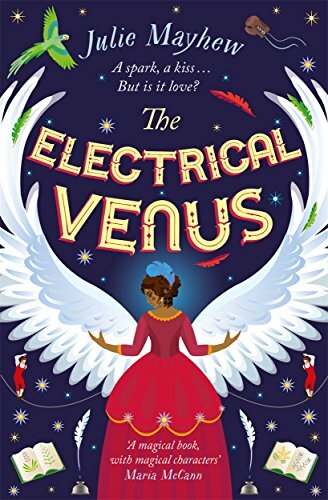 When smooth talking Mr Fox joins the fair, Mim finds herself catapulted to fame as the Electrical Venus whose kiss will shock. But is this really magic – or is she just a pawn in Fox’s ambition? To conclude Mayhew provides extensive note on the origins of her tale, fascinating in itself, allowing a young reader to explore further without detracting from the freshness of her storytelling.